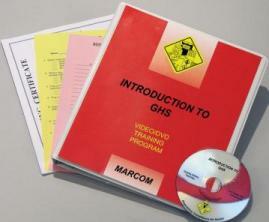 MARCOM's Introduction to GHS (The Globally Harmonized System) DVD Program is designed to review what the Globally Harmonized System is all about, why OSHA adopted the GHS, and the phase-in dates for implementing the GHS. Created specifically to assist facilities in complying with the employee training requirements of OSHA's newly adopted GHS regulations, these products discuss the Globally Harmonized System for the Classification and Labeling of Chemicals. Topics covered in the program include information on what the Globally Harmonized System is, why OSHA adopted the GHS, hazard classification, the Safety Data Sheet, container labeling, information and training, GHS phase-in dates, and more. The DVD program comes with a comprehensive leader's guide, reproducible scheduling & attendance form, employee quiz, training certificate and training log.